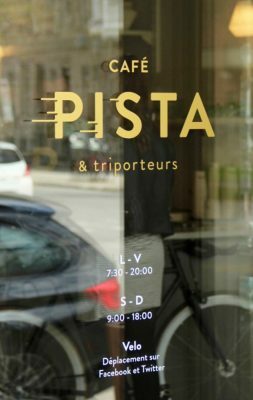 As a continuation to the implementation of food trucks in Montreal, the Pista Café Mobile, where you can find some of the best coffee in town, was created a little over two years ago as a tricycle/invention. 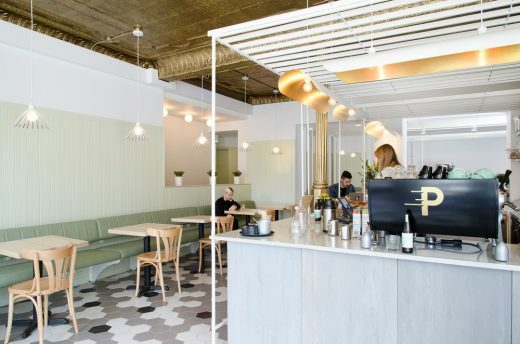 After being showcased in all of Montreal’s festivals, the Pista Café tricycle found an address of its own in the heart of Rosemont-La Petite-Patrie. image : EGP TechnoVirtuel inc. The goal: To make the shift from being a nomad café to being a sedentary one, while still keeping a street stall feel. 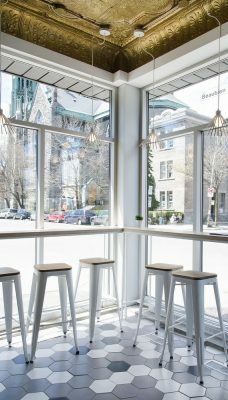 The chosen location, on the corner of Beaubien and Saint-Vallier, is imbued with both history and character. 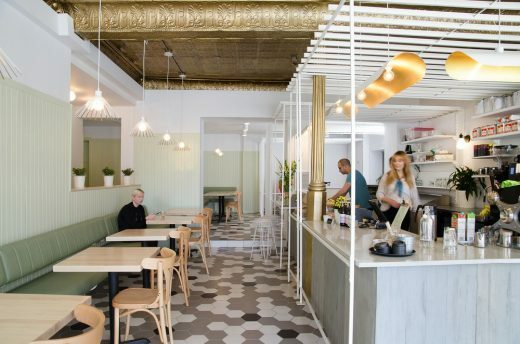 We’re looking at a simple and refreshing concept: to create a cozy, luminous and unique spot where the inside recreates the outside. 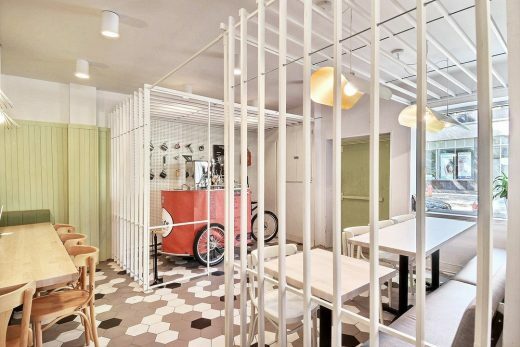 What a wonderful challenge for Les Ateliers Guyon design studio. 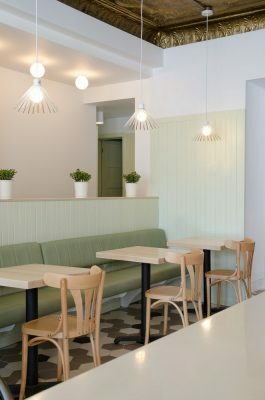 Félix Guyon, founder at Les Ateliers Guyon, has given birth to a second company specializing in luminaire design, along with its cofounder Audrée L.Larose, called Larose Guyon. 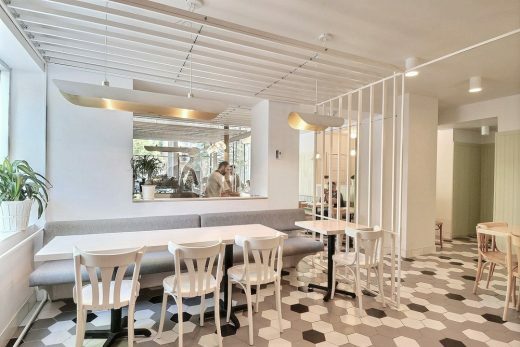 Audrée L. Larose and Félix Guyon, design lovers and lovers in life, combine both of their visions and offer a design both masculine and feminine, where contrasts confront each other in a meticulous, subtle and bold design. They tell us their story: “We literally found each other, we form the best possible team we could have imagined. Our strengths support the other’s weaknesses and vice versa. From our often opposed visions arise results which surpass our first intentions every time. We like to see ourselves as follows: Félix is a burst of ideas and Audrée is the funnel which refines and gives focus!’’ Together they become a “dream team“, as they put it themselves, laughing. Their combination recently led them to present their Larose-Guyon Luminaire project at ICFF 2016, in New York. An artistic installation project for a few Chicago hotels is also in the works. These two multidisciplinary designers should stay on your radar, as it looks like their next projects are going to be more and more surprising!